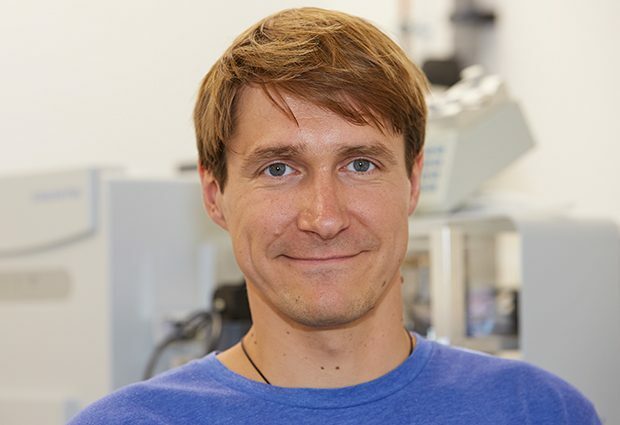 A mathematician who got ‘sucked in’ to biological problems, new team leader Theodore Alexandrov will draw on everything from cryptography to software development to help biologists and chemists see data in a new light. The Alexandrov Team aims to bridge computer science and biology, by providing tools that reveal where different chemical reactions take place within a cell, tissue or an organism. The team’s two flagship projects are the molecular cartography of the human skin surface, and the molecular annotation of high-resolution imaging mass spectrometry data. How did you move from mathematician to biologist? Oh, definitely a computer. I started programming pretty late, compared to my peers – at about 15 years old. Someone gave me a computer and I was amazed; I’m still amazed. It’s like magic: you can implement your thoughts into something almost material. You start coding, you type things, and then, for example, you have this beautiful software that can rotate something or plot something. Carrying a computer is like having a bit of magic on your lap, because it’s instantaneous: people can see your thoughts in minutes. Whose work at EMBL intrigues you? Do you already have potential collaborators in mind? Yeah, many people! Before I joined I wrote a shortlist, partly to show that I could be integrated – something everyone should do when applying for a group leader position – but also because there are lots of scientists here doing fascinating science; I think I’d be happy collaborating with everyone! That’s why, when there are opportunities I jump on them, resources permitting. It’s a very cool environment: you get empowered, and we empower each other in these collaborations. The group should be interdisciplinary, it should be small, and every person should be independent and excellent in some way. What is your philosophy for running your lab? I don’t know whether it’s a philosophy as such, but I’m trying first of all to make everyone equal. There is no difference whether you’re a master’s student, a staff researcher, a postdoc – everyone contributes. I’m also trying to create an environment that fosters group members, not directs them. As a boss, you provide the environment and the infrastructure, and then you see what comes out. What will you be looking for as you build your group? I would like to have a small but interdisciplinary team – already, we have people from cell biology, theoretical computer science, analytical chemistry, and software development, including someone who helped to develop Google Chrome. They are benefiting a lot from talking to each other. So, the group should be interdisciplinary, it should be small, and every person should be independent and excellent in some way. If there was a motto hanging at your lab’s door, what would it be? Hmm, I don’t have a motto all thought out, but I can give you some keywords that would definitely be in it: I highly value ‘openness’; I like to act as a mediator across a wide range of expertise, so ‘interdisciplinarity’ – while much over-used – is key; ‘motivation’ would have to be in there, too, as I try to achieve things by getting people motivated. Finally, our overall aim is ‘data translation’: translating data – numbers, letters, documents, results – into something useful by crunching numbers, connecting dots, finding something never observed before, and representing it so that biologists and chemists will see things anew. Where do you come from? What are the best things about science in your country? Science has a strong tradition in Russia. It stems from imperial times, and was intensified in the Soviet era. There was a culture of science – to be a scientist was a well-regarded profession. Nowadays, theoretical science is still really good, especially technical sciences like mathematics. Sometimes when I say where I come from – “I’m from St. Petersburg, and I got a PhD there in mathematics” – everyone is like ‘ooh!’.